Follow the instructions below and you can turn almost any crew neck tee into a feminine top. By cutting away the knit band at the neck and adding some lace, you’ll have a very different shirt. The steps below will guide you through shaping the front opening, reinforcing the neckline, creating a facing and attaching the lace. For the best results, use wide lace. Mine is 2” wide and when joined together creates a prominent 4” trim down the front. Be sure to throw the shirt and lace in the washer and dryer beforehand. I created my shirt from a long sleeve, crew neck tee and shortened the sleeves to add the lace. But I want to share what I do sometimes to get the same results when all I can find are short sleeve shirts. I often find Sonoma tees on sale at Kohl’s for $6-$8. The quality Sonoma fabric is very soft and doesn’t wrinkle badly like some tees. I wish I could find material like it in my local fabric shops. I don’t always like the style of the shirts I see at Kohl’s. For instance, I often find short sleeves when I want 3/4 length. My solution is to buy two identical shirts, one in my size and one extra large for sleeves or other restyling I want to do. When my shirt is finished I have the sleeve length or style I want and a fabric I love for just $16. I think that’s a very good bargain. And when I have a Kohl’s $10 gift card, I get one shirt free! step 1 - Cut off the knit band on the neck edge. Cut carefully and close to the band to maintain the neck shape. step 2 - Iron a crease down the center front of the shirt from the neck to the hem. step 3 - Decide how much of a slit or opening you want in the center front and place a pin to mark that point. Also mark where you want the lace to stop at the bottom of the shirt. The ideal spot would be two inches above your waistline. step 4 - Temporarily place two pieces of lace side by side down the front of the shirt with the long lace edges meeting on the crease. step 5 - Move the top of the lace strips .75” away from the center crease but still meeting at the mark for the opening. 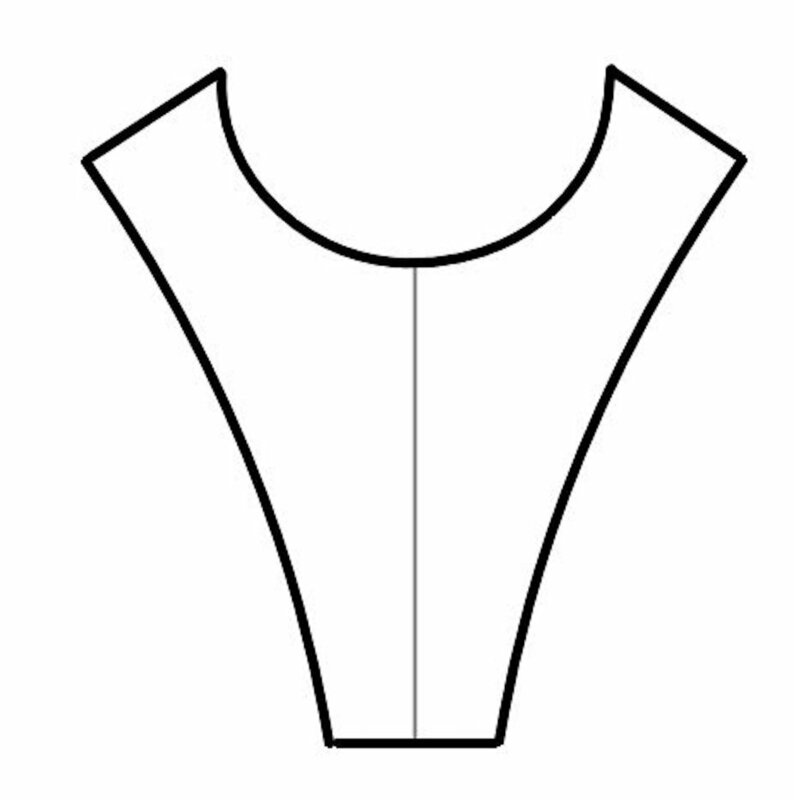 step 6 - Measure the width from one lace outer edge to the other at the neckline. step 7 - Make a tissue paper pattern for the interfacing by tracing the lace. It should narrow from the neckline measurement to the width of two pieces of lace. The length should reach from the neck to an inch below the opening mark. Trim off .25” vertically from each long side. step 8 - Center and fuse the wrong side of the interfacing to the right side of the shirt. step 9 - Make a pattern for the facing using white knit fabric. Trace the shirt neckline from shoulder to shoulder, adding shoulder seam allowances. The length of the pattern should match the interfacing pattern. Finish all the edges except the neckline with a serger or zigzag stitch. step 10 - Place the facing fabric right side down on the shirt. Sew a “V” starting and ending .75” from the center front line. Trim the seam cutting close to the stitching lines. step 11 - Use a fine zigzag stitch to join the two lace strips stopping at the top opening. Position the joined lace strips on the center of the shirt 2.5” above the waistline. With the right side of the lace against the right side of the shirt pin or tape in place. Stitch across the width of lace. Remove the tape and trim the lace edge. step 12 - Because the lace strips curve outward at the neck area, the outside edges will not lay smooth. Remedy this by sewing a gathering stitch on the outside edges of the lace to ease in the extra fullness. step 13 - Position the lace on the shirt front using the center crease as your guide. Open out the facing and pin the lace in place. step 14 - Position the right side of the facing over the right side of the lace matching neckline and shoulder edges. Stitch a 5/8” seam from the shoulder seam to the center front neck. Trim the seam. Attach the facing to the other neck edge. Trim the seam. step 15 - Stay stitch the shirt’s back neck edge. Create a band for the back neck by cutting a strip of fabric the length you need by 2.25” wide. Fold the strip in half. Pin the raw edges to the shirt stretching slightly. Sew the back band ends to the front facing at the shoulders. Press open the seams. step 16 - Use a 5/8” seam to sew the band to the neck. Top stitch the allowance to the band then cut away excess bulk. Turn the band to the inside of the shirt and top stitch in place close to the folded edge, from shoulder to shoulder. step 17 - Turn the front facing inside the shirt. With a regular stitch, sew the outside and bottom edges of the lace to the shirt catching the facing as you work. Finish by sewing close to the center “V” to join the shirt to the lace.